A mini-documentary, featuring a Houston Viet Association soccer tournament, will be filmed in Houston over the Thanksgiving weekend. The video is sponsored by the Non League America website and will be directed by Alfonso Bui, who delivered a superb documentary last year on the journey of Dallas area-native Lee Nguyen, currently a midfielder for Los Angeles Football Club in Major League Soccer. The tournament will take place on Saturday and Sunday November 24 and 25 at Cullen Park on the west side of Houston. Eight adult teams will participate, divided initially into two groups for a round-robin group stage on Saturday. The top two teams from each group will advance to semifinals and the winners will play for the Championship trophy on Sunday afternoon. Eight teams participating come from three states. 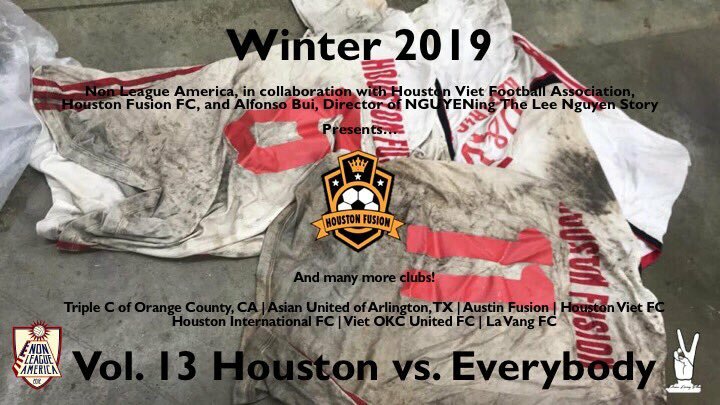 Four teams from Houston (host Houston Fusion, Houston Viet FC, Houston International FC and LaVang FC), two others from Texas (Austin Fusion and Asian United of Arlington) and teams from Southern California (Triple C of Orange County) and Oklahoma (Viet OKC United FC). This tournament will be the latest in a series of soccer events hosted by organizer Jimmy Vo since 2010. Previous competitions have taken place over Memorial Day weekend. The Thanksgiving event is an experiment to determine if a more weather-friendly time of the year in Houston will work better for the long-term benefit of these annual events. Vo, who grew up playing soccer in Vietnam under the tutelage of his father, emigrated to the United States in 1993. After continuing to play soccer on the West Coast for a number of years, he settled in Houston in 2008 and quickly went to work helping to organize the sport in the local Vietnamese community. After taking time to establish a soccer framework in his community, Vo created the non-profit Viet Football Association a few months ago to take the process to the next level. He talked about how much previous generations had done for him and how his work is a chance to give back. Non League America is dedicated to celebrating the culture of the wide-variety of US Adult Soccer Association sanctioned and unsanctioned semi-professional and amateur leagues throughout the country. A few years ago, founder Steve Bayley and his co-founder Chris Reid started producing mini-documentaries to supplement the written and podcast work on their site. Samples of their videos can be found in this link. Bayley, who felt this Viet Soccer tournament was the perfect opportunity to ramp up Non League America’s documentary program, then reached out to Alfonso Bui to put more emphasis behind this effort and add a professional touch to cataloging the tournament. Bui’s work in Houston next week will be supported by Jamisa Johnson who has worked with Non League America on previous videos. Bui’s excellent video on Lee Nguyen “NGUYENing/The Lee Nguyen Story” has been favorably received by the national and international soccer communities since its release last year. Non League America currently plans to release the Houston Viet Football Association documentary in February of 2019. It can be a challenge for anybody who hasn’t lived, or spent significant time, in Houston to understand just how diverse and vibrant the community is. In fact, the late Anthony Bourdain dedicated a 2016 episode of his CNN Parts Unknown TV series to just this topic. This diversity can also clearly be seen in the depth and breadth of the Houston Soccer community throughout all its neighborhoods. It is nice to see the efforts of Jimmy Vo and others involved in growing the game in the local Vietnamese community get the national attention it deserves. I will post the link to the documentary on Texas Soccer Journal when it is available.